From 2004 to 2006 Director of the Interdepartmental Research Centre of the University of Pavia European Centre for Law, Science and New Technologies (ECLT). 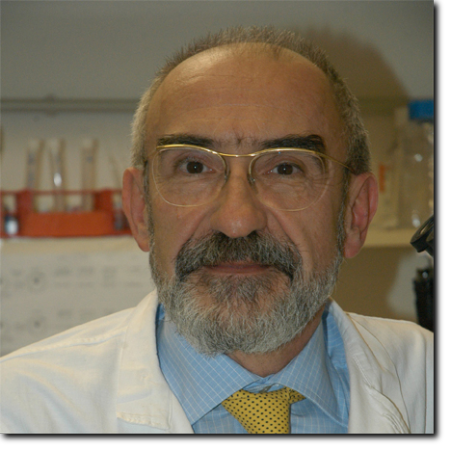 Carlo Alberto Redi is currently scientific head of the Fondazione IRCCS Policlinico San Matteo Hospital – Pavia (Italy) and head of the section for Developmental Biology at the Department of Animal Biology. A chemist by training (1968) he graduated in Biology (1972) from the University of Pavia as an alumnus of Collegio Ghislieri. He started his university career as Researcher (1973 – 1975) and Associated Professor (1975 – 1989) at the Institute of Histology and Embryology, University of Pavia, where he progressed to become full Professor of Zoology and Developmental Biology (1990). NATO fellowships at the Department of Cytochemistry, Sylvius Laboratoria, University of Leiden (1977), The Netherlands (quantitative DNA cytochemistry) and at the Department of Pathology, University of Lubeck (1978), Germany (chromosomally derived sterility). Visiting Professor at the Department of Experimental Pathology, University of Dusseldorf (1980 and 1984), Germany (germ cell renewal and experimental reproductive biology). Co-organizer of the 13th International Chromosome Conference (1998). He was awarded the 1998 National Prize for Biological Sciences of the President of the Italian Republic. Member of the Dulbecco Commission for the study of the therapeutical use of stem cells (2000). Together with Amedeo Santosuosso, Silvia Garagna and Andrea Belvedere he co-founded the European Centre Life Sciences, Health and the Courts (ECLSC), University of Pavia, Italy (2004). Managing editor of the European Journal of Hystochemistry since 1990. Honorary member of the Sociedad Genetica de Chile (2000) and Member of the Accademia Nazionale dei Lincei (Italian National Academy of Sciences; 2003). His field of research has been the DNA cytochemistry of male and female germ cells in mammals and insects. His main achievements are the elucidation of the DNA sequences involved in Robertsonian traslocations and the timing of sperm protamine substitution during male pronucleus formation in the mouse. His main current area of interest is the development of an artificial cytoplast to genetically reprogramme somatic cell karyons to pluripotency. His career has been marked by more than 100 peer reviewed publications in distinguished journals and books.